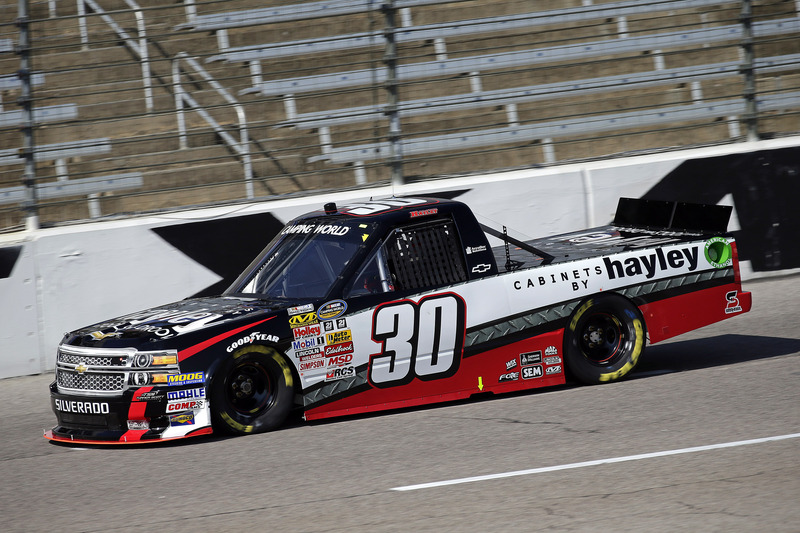 Sandusky, Ohio (June 9, 2015) - Securing his fourth NASCAR Camping World Truck Series (NCWTS) career top-10 finish in last Friday's WinStar World Casino 400k at Texas Motor Speedway in Fort Worth, Cameron Hayley, driver of the No. 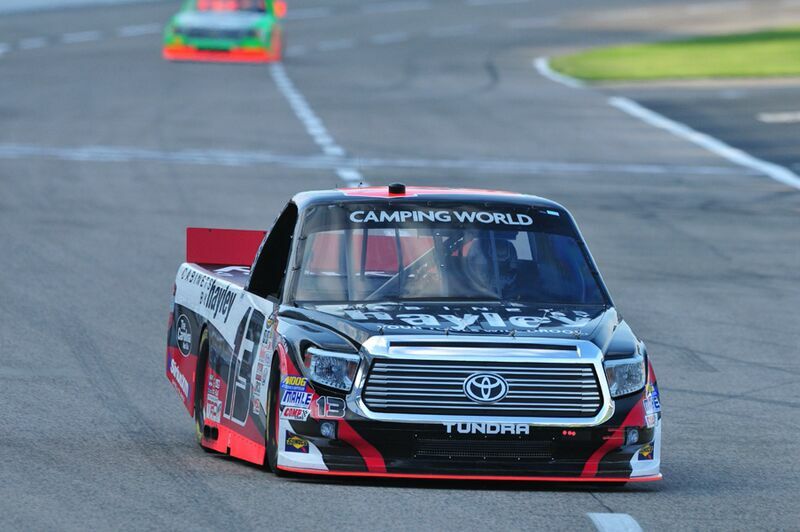 13 Cabinets by Hayley Toyota Tundra, is ready to make his seventh different track debut of the 2015 season at Gateway (Ill.) Motorsports Park for the Drivin' for Linemen 200. Growing up in the short track world, the Sunoco Rookie of the Year contender is excited to return to his roots Saturday at the 1.25-mile oval in Madison, Illinois. However, with no previous starts at Gateway Motorsports Park, Hayley has been told it is a close comparison to New Hampshire Motor Speedway in Loudon, a track he does have experience at. The Calgary, Alberta, Canada native has one start to his resume at the 1.058-mile track in the NCWTS (September, 2014) and one start in the NASCAR K&N Pro Series East (July, 2014). Hayley scored top-15 finishes in both showings, including qualifying on the front row and finishing sixth in his NCWTS debut. Hoping to hone on his inner short track racing skills during the 160-lap event Saturday night, 18-year-old Hayley is confident he can keep momentum rolling. Maintaining an average finishing position of 12.2 this season, with a career-best finish of fifth at Kansas Speedway in Kansas City earlier this year, the Sunoco Rookie of the Year contender is knocking on the door of his first NCWTS win. "I've heard that Gateway is a very fast short track," said Hayley. "I was able to race at Loudon last year and I've heard they are pretty similar in style to each other. That was a great race for me last year. I qualified second and finished sixth. Hopefully that will be a bonus for me going into Gateway this weekend. Short tracks are where I grew up racing, so it'll be nice to go back to a 'home track' feel per say." Chassis Chatter... The No. 13 ThorSport Racing team will unload chassis No. 49 for Saturday's Drivin' for Linemen 200. This is the same chassis Hayley piloted in his Martinsville (Va.) Speedway debut, finishing 11th, after running inside the top-five for a majority of the event. Rookie Race... Hayley moved into second-place in the 2015 Sunoco Rookie of the Year battle after seven races this season. The ThorSport Racing driver now trails leader Erik Jones by 40 points. Previous Race Recap... Making a strong statement in his second NCWTS trip to Texas Motor Speedway, Hayley ran within the top 15 for a majority of the 167-lap WinStar World Casino 400k Friday night. With pit strategy coming into play early on, the Sunoco Rookie of the Year contender was able to lead three laps en route to his fourth career top-10 finish, finishing seventh. Cabinets by Hayley is the premier manufacturer of metal garage and storage cabinets in Canada, coast to coast. Formed in 1978, Hayley Industrial Electronics Ltd. produced high-powered, uninterruptible power supply units for heavy-duty applications. After nearly 30 years of high-standard systems in the industrial field, Hayley formed Cabinets by Hayley to service the residential market. Now, Cabinets by Hayley offers a full line of metal storage cabinets for the people that want the best in quality and appearance for their storage needs. To learn more, visit www.CabinetsByHayley.com. Fort Worth, TX (June 6, 2015) - After a heartbreaking finish in Dover last week, Sunoco Rookie of the Year contender, Cameron Hayley, rebounded with his second top-10 finish of the 2015 NASCAR Camping World Truck Series (NCWTS) season, snagging a seventh-place finish during the WinStar World Casino 400k at Texas Motor Speedway in Fort Worth. Sandusky, Ohio (February 10, 2015) - ThorSport Racing is pleased to announce that NASCAR Next driver Cameron Hayley will pilot the No. 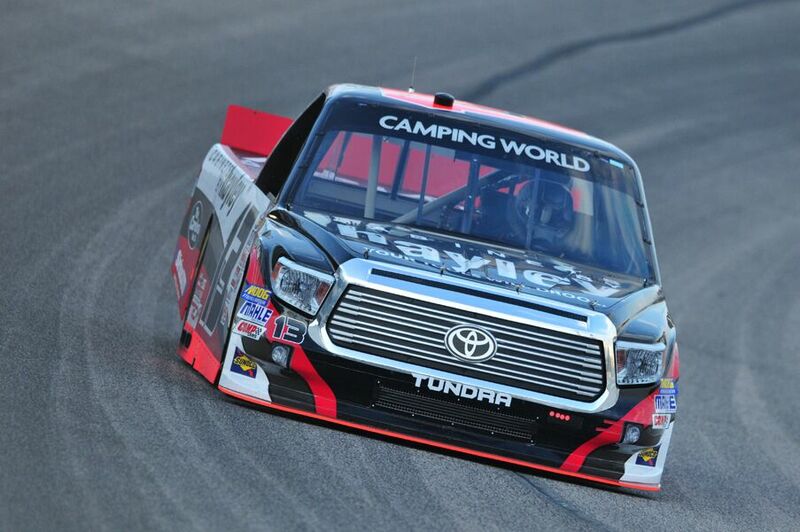 13 Cabinets by Hayley Toyota Tundra full-time in the NASCAR Camping World Truck Series (NCWTS) in 2015. Hayley, who made his series debut in 2014 at Canadian Tire Motorsports Park in Bowmanville, Ont., Canada, and has three series starts to his resume, will compete for Sunoco Rookie of the Year honors this season. The 18-year-old driver began his racing career in karts at the age of seven and debuted in NASCAR by running a partial K&N Pro Series West schedule in 2011. Hayley, the youngest driver ever to compete in the K&N West series, posted top-five finishes in two of his four starts, including an impressive second-place finish in his series debut at Montana Raceway Park in Kalispell. His success led to a full-time K&N Series West schedule in 2012, where he posted five top-five and nine top-10 finishes. Hayley was also named to NASCAR’s Next class in 2012, a select group chosen by the sanctioning body that spotlights NASCAR’s rising stars. Hayley started his 2013 season with a bang, winning the UNOH “Battle at the Beach East vs. West Shootout” at Daytona (Fla.) International Speedway and capped off his second full-time season in the NASCAR K&N Pro Series West with one win, six poles and a second-place finish in the driver point standings. In 2014, Hayley competed full-time in the NASCAR K&N Pro Series East collecting one pole, and leading 247 laps en route to seven top-five and nine top-10 finishes. The Calgary, Alta., native went on to make three NCWTS starts in 2014, amassing a career-best second-place starting position at New Hampshire Motor Speedway in Loudon and amassing two top-10 finishes. Hayley’s 2015 campaign will be led by Xfinity Series championship-winning crew chief, Jeff Hensley. As an 11-year veteran of the NCWTS, Hensley has 260 series starts to his credit including 13 wins, 31 poles, 72 top-five and 137 top-10 finishes. As the longest tenured team in the NCWTS garage, ThorSport Racing will kick off its 20th season of competition in the season-opening NextEra Energy Resources 250 at Daytona (Fla.) International Speedway on Friday, Feb. 20. All the action will be televised live on FOX Sports 1, MRN and SiriusXM NASCAR channel 90. 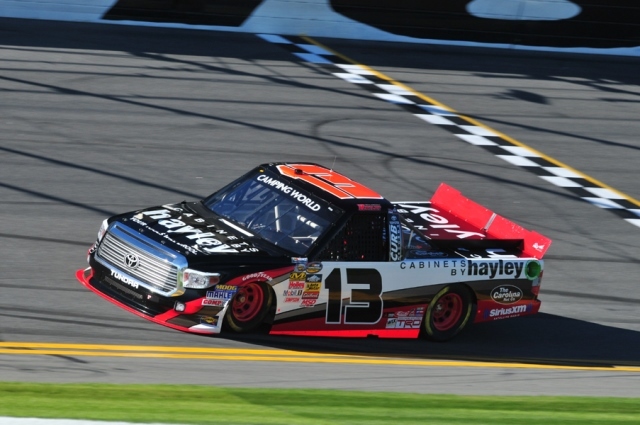 Daytona Beach, FL (February 20, 2015) - Sunoco Rookie of the Year contender, Cameron Hayley, made his NASCAR Camping World Truck Series (NCWTS) debut at Daytona International Speedway (DIS) on Friday night in the NextEra Energy Resources 250. Showing speed and craft in both of the series' practice sessions on Thursday afternoon, the 18-year-old driver posted the second fastest time in final NCWTS practice and followed that up by posting the second fastest time in the first round of NASCAR's unique three-group, knockout pole qualifying on Fridayafternoon. Advancing to round two, Hayley would post the 14th fastest time overall, locking the Canadian native in to the seventh row for Friday night's 100-lap race. The newly named ThorSport Racing driver was able to advance to the 11th position by lap five, and maintained his position for the next 10 circuits. When the race's first caution flag was displayed at lap 15 for a 10-truck pile-up in Turn 1, crew chief Jeff Hensley brought the No. 13 Cabinets by Hayley Toyota Tundra to pit road for right side tires and fuel. When racing resumed on lap 19, the rookie was scored 11th. Hayley would run as high as sixth over the next 30 circuits before being getting caught up in the "Big One," at the race's half-way mark at lap 50. Extensive damage to the No. 13 ThorSport Racing machine would sideline the rookie for the remainder of the event, and ultimately credit him with a 23rd-place finish behind race winner, Tyler Reddick. "I tried to go to the outside and just couldn't get there and the next thing I knew, I was sideways. I learned a ton tonight, especially about the draft; my spotter Eddie D'Hondt helped me a lot. I don't know what to say other than this Cabinet's by Hayley Toyota Tundra was amazing tonight and I believe we had a really good shot to win it, but it just didn't work out for us." FORT WORTH (November 1, 2014) - The NASCAR Camping World Truck Series (NCWTS) made its second and final stop of the 2014 season on Friday night at Texas Motor Speedway for the WinStar Word Casino & Resort 350. Cameron Hayley and his No. 30 Cabinets by Hayley team looked for a solid finish in his first-career start on a mile-and-a-half oval. After two solid practice sessions on Thursday afternoon, Hayley went out on Friday and earned a top-five starting spot during NASCAR's knockout qualifying. After battling a loose race truck during the middle portion of the race and surviving a green/white/checkered finish, Hayley crossed the finish line in the 10th position. "Wow, what a blast that was. I couldn't be more proud of the guys that worked on the No. 30 Cabinets by Hayley Silverado all week. I wasn't really sure what to expect as I made my first laps around a mile-and-half track, but Shannon and the guys had the truck really dialed in right off the hauler. I can't thank these guys enough for giving me this opportunity and hopefully we can build on this finish moving forward."